Ladys Walk were crowned Kerry Junior Hurling champions after a one sided encounter at Abbeydorney this evening. An early goal from a long range free by Sean Browne set the winners on their way and another goal from the same player saw them lead by 2-6 to 0-2 at the break with Ger Guerin getting both points for Duagh. Some sterling play by the Bill Maunsell of Abbeydorney Sports Complex Man of the Match Chris Whyte at midfield and another goal by Sean Browne ensured that victory rested with the Duffers. 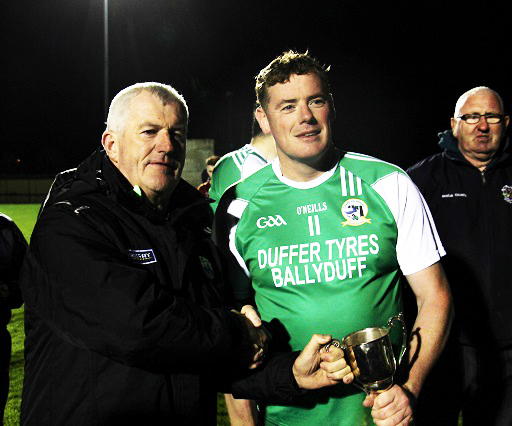 After the game, Hurling Officer Ger McCarthy presented the Cup to winning captain Eddie Joy.